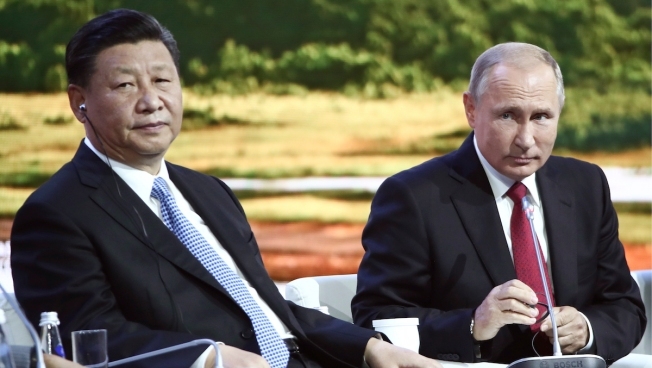 After their third meeting in four months, Russian President Vladimir Putin and Chinese President Xi Jinping agreed their countries relations are "showing dynamic growth," NBC News reports. The two leaders recently met at the Eastern Economic Forum, where they discussed military and economic cooperation. The two have been forced into accelerated discussions because of America's increased economic pressure on the countries, some say. The latest evidence of this pressure came on Monday when the Trump administration announced a new round of tariffs on China, slapping a 10 percent tax on a $200 billion list of Chinese imports ranging from consumer goods to manufacturing materials.